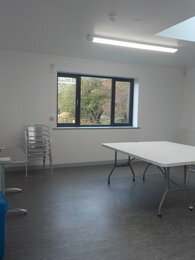 This is a lovely room to hire for children's birthday parties or craft activities for about 20 people. There is also a small kitchen adjacent to the room, where you can prepare cold food and make hot drinks. Discounts are available to members of the farm. For further information about becoming a member go to the Help Support Us page. The income raised through room hire is essential for the farm to keep running. Funding is is increasingly scarce and the ability to generate income from our rooms enables the farm to continue to provide a free, friendly, green space within the community.